The real treat this ice cream man peddles is teaching others to pay it forward. 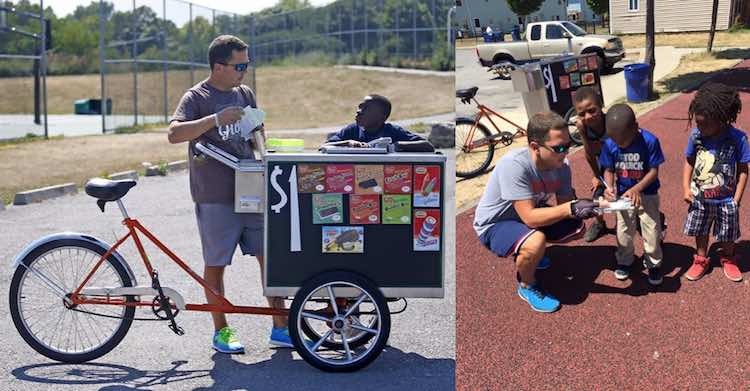 The “Creamcycle Dude,” James Karagiannis, sells frozen treats for a dollar from his pedal-powered cart in under-served neighborhoods of Buffalo, New York. He felt bad whenever kids couldn’t afford the cost, so he started giving away the treats for free if they could answer a history or math question — and giving them hints to help. As people found out about the Dude’s generosity, they began sending money to pay for the treats he gives away. So far, more than $6,000 have been donated, but he’s also an additional lesson to the curriculum for his little customers — he’s asking them to write “thank you” letters to the donors whenever they take a frozen treat. Karagiannis has been so surprised by all the attention and donations, he hasn’t been checking the total that’s come in. It’s also a lot of thank you notes to write and gratitude to inspire. The Creamcycle Dude says he’ll use any leftover money for youth programs in the community.